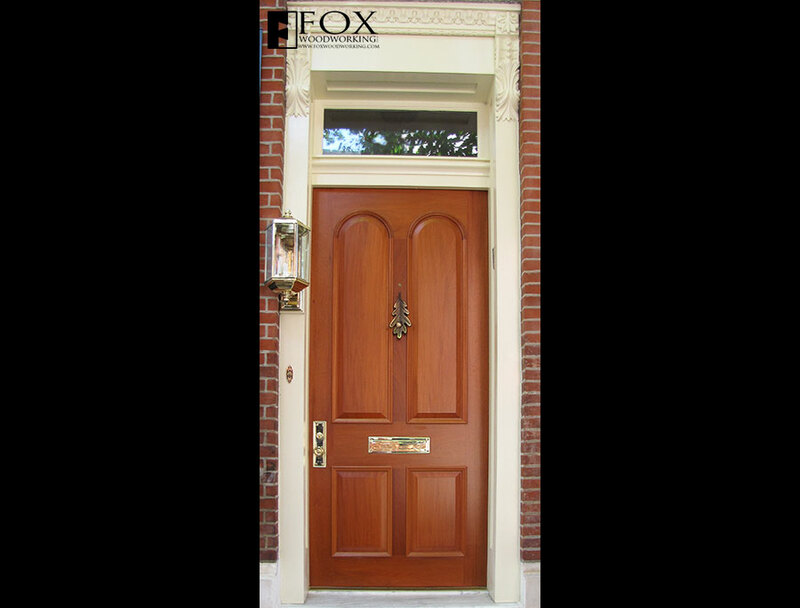 We built this mahogany door (as well as the painted jamb and transom window) to replace a dilapidated door and jamb on a home that was remodeled near Rittenhouse Square in Philadelphia, PA. The original door had seen better days and the lower portion of the jamb had begun to rot away. While the original door was painted, the clients and the contractor, Hansell Contractors, Inc., had decided that a mahogany version would make a much more dramatic statement. To maintain the historic look of the house, this mahogany door is made with the exact molding profiles and dimensions as the original door. Building this mahogany door was a true pleasure. First, we had the opportunity to work with genuine mahogany - not one of the many substitutes. Second, we were able to showcase our skills with curved moldings. The moldings around the raised panel were made by having shaper cutters made that exactly reproduced the original molding. Next, we created a jig to cut the curved pieces. Then, we pieced together the frames and hand-sanded them to blend all of the elements together. On the inside of the door, the panels are flat and sit flush with the stiles and rails. They are surrounded by a beaded inset molding. While the straight elements of this molding were done with a router, the curved top portions were crafted with a combination of router bits and hand-carving. 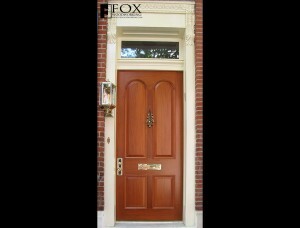 The mahogany door was finished with a clear catalyzed polyurethane. We made the door jamb using Spanish cedar (sometimes substituted for mahogany) and then painted it. The transom window is a piece of insulated glass. The carved trim elements on the upper part of the jamb, as well as the ogee molding below the window, are the only pieces left from the original jamb. They were safely removed, cleaned of old paint, and remounted onto the new jamb. To see photographs of the rest of the home, please click here. To see more photographs of doors, please click here.